MDE is 10 years old today and quite a milestone for us. Many of our followers have indicated an interest in our company’s story, so I thought I would share what I consider to be some of the key events or milestones of the first ten years, , , and what they mean to our company. Many of these “lessons learned” may be helpful to you in your life. 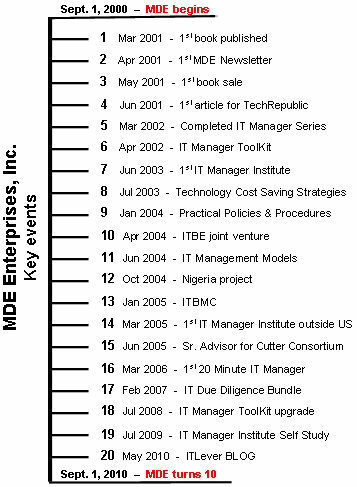 The graphic to the right highlights 20 key milestones that have occurred between our company’s inception (September 1, 2000 at the top of the chart) through today, ten years later. Below, I discuss each milestone briefly and define the significance the event had for our company with the hope that providing this insight might be helpful to you in your business. September 1, 2000 – I walk into my CEO’s office to tell him I’m planning to leave the company. We work out a 6-month transition that is extended twice and ends after 13 months. My new company, MDE Enterprises, is started. MDE begins as a consulting company in a time I would soon learn to be a tough time to start a new consulting company due to the “dot.com” crash. Lesson learned – find ways for a “win-win” and you are likely to be more successful in a difficult situation. My first book titled What To Look For in a CIO, an e-Book actually, is completed. During the writing of this book, it hit me that I needed to write a series of “how to” books about managing IT organizations effectively. An “all nighter” and I had a set of Table of Contents for 9 more books in a series I would call the IT Manager Development Series. Early on I determine that I don’t want to depend on consulting for my livelihood, , , I gradually conclude that I want to become a training and education company to help IT managers achieve more success. Lesson learned – looking for answers often leads you to uncharted waters, but you can do anything you set your mind to do. Our first newsletter went out to 100 people, , , my immediate contact list. 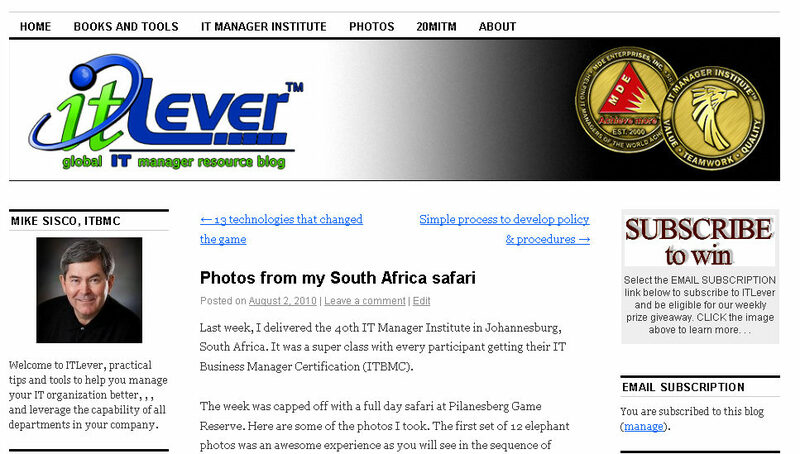 Today, we have almost 20,000 managers from all parts of the world who subscribe to my Practical IT Manager Newsletter. Lesson learned – if you plan an internet business, you have to build your list. It will be a key to your success. Lesson learned – amazing what a $19.00 sale will do to motivate you. A contact is made with TechRepublic and they contract me to write an article. This leads to me writing over 100 articles for TechRepublic in the next two years. To date, I’ve written well over 300 IT manager articles for many organizations including HP, HDI, Cutter Consortium and others. Lesson learned – there is a direct cause and effect response rate in providing material for your target market and creating significant awareness. 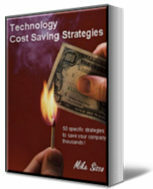 The first ten e-books I envisioned are completed. WHEW!!! During this time, I posted the Table of Contents of all the books on my web site and started selling the full series at a discount while I was writing them. We sold 102 sets of the full series before I had all ten books written and over 75% of all orders were for the full series. This reinforced to me that this content was really needed. Upon completing the series, I increased the price by 55% and sales actually went up. Lesson learned – be careful what you sign up to do as it may take longer than you think. 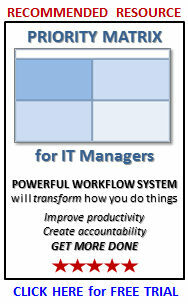 All of the books discussed management tools I had developed to do certain things like budget, manage projects, etc. As I was writing the books, I decided that a Tool Kit was needed, , , so when I finished the 10th book, I quickly focused on documenting my tools. 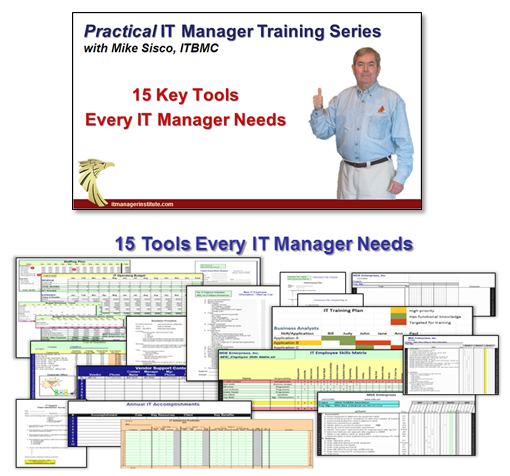 The IT Manager ToolKit is released on “tax day” in the US (April 15th) with 80 tools and templates. This was a tough project because I had to document each tool, , , thought I would never finish it. Because I had so many who had purchased the full series of 10 books before I had them all written (I call them “early buyers”), I decided to simply give them the ToolKit as a free gift. It felt good and was the right thing to do because they took a risk with me. My “early buyers” still receive a 40% discount on anything I develop. Lesson learned – giving your client more than what they expect has positive ramifications. 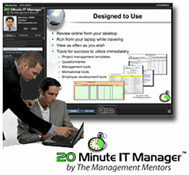 An early dream of providing classroom training to develop key IT management skills is finally realized. I tried to deliver a class in early 2002 but wasn’t able to fill any seats, , , lost some money and learned a hard lesson. Bottom line is that I wasn’t really positioned to deliver training in 2002 because I was still working on the books, , , needed to finish them first. As the book sales got established in 2002, Dorine and I decided we could move “back home” to Tennessee to be closer to family so we did. Our move might not have been possible without the internet business doing so well. During the move, I was contacted by Belmont University in Nashville, Tennessee about IT manager training. Belmont would become a key partner in delivering future IT Manager Institute classes. 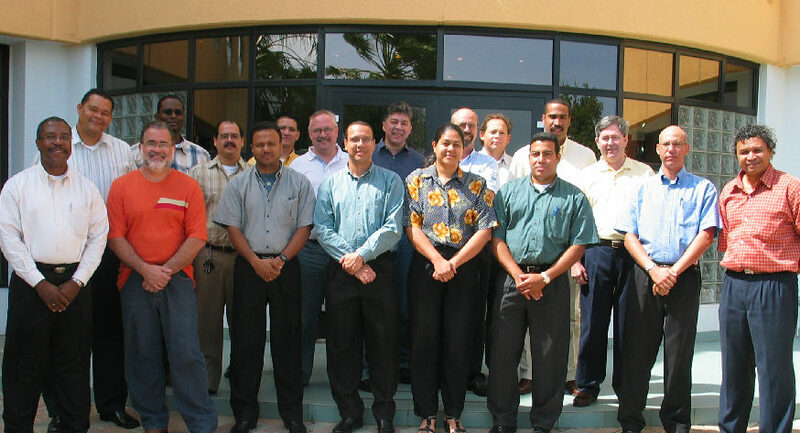 To date, we have delivered 40 IT Manager Institute classes in 8 countries. Lesson learned – stay focused to your mission and persevere through the trials that ultimately try to block your success. Book #11 is completed from the training session I inserted in the IT Manager Institute to help participants of the class find ways to reduce expenses in their company and more than recoup their cost in attending the class. I learn the value of leverage. Lesson learned – take advantage of efforts in one area of your business to help other parts of the business. Book #12 is completed, , , didn’t really want to write this one but kept getting requests from my newsletter subscribers. This book became one of my better selling items. Lesson learned – listen closely to your client. A relationship is created with IT Business Edge, a young start-up company at the time who provides newsletters and other tools for IT decision makers. They are a young company but deep in experience in growing this type of business, , , it’s the same group who started TechRepublic and grew it significantly. They begin promoting the IT Manager Development Series as a premium product and it quickly becomes their top selling premium product, , , and it remains at the top today. Lesson learned – the importance of solid joint ventures and the power good marketing skills offer your company. I complete my 14th book and the one I had the most fun in writing. “Models” is unique and has some humor weaved in it. The announcement and release of this book went very well as I did much more to create awareness and offered a significant “new offer discount”. Lesson learned – the power of networking and a bit about the strategy of launching a new product. I agree to do a distance learning project with a company from Nigeria who discovers I’ve had many experiences in mergers and acquisitions. It seems the Nigerian banking industry is about to go through a major industry consolidation and they want to hold a seminar to place an emphasis on conducting a thorough IT due diligence to support mergers the banks will work through. I meet Adedoyin Odunfa (by phone and email), a senior manager of the consulting company. Adedoyin and I become trusted colleagues and later great friends. Her company has hosted 9 IT Manager Institute programs in South Africa, United Arab Emirates, and Nigeria. Lesson learned – the value of delivering more than what is required or expected and the good things that can happen. With Belmont University’s help, we develop the IT Business Manager Certification (ITBMC) to compliment the IT Manager Institute training. I wasn’t planning to create a certification but more and more of my students wanted it. When completed, it made a big difference in student registrations and helped us attract many who would not have been interested without the certification. 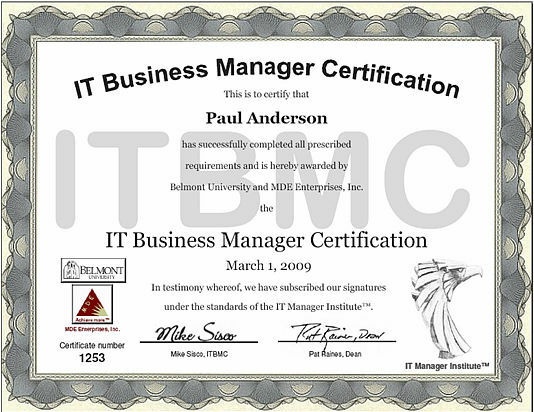 The ITBMC is still (as far as we know) the only certification that emphasizes the importance of an IT organization delivering tangible and quantifiable business value for its company, , , and provides the insights and tools to help you make it happen. Lesson learned – another reinforcement of how important it is to listen to your client. Our first class class outside the US was Aruba, a tropical paradise in the Caribbean. The ITBMC certification was a key part of landing this class and the start of a joint venture with e-Solutions Caribbean who would host two more classes in Aruba and Curacao. Lesson learned – IT people want certifications, , , just because something is not that important for you doesn’t mean it isn’t for the other person. Another joint venture is created with Cutter Consortium as I develop a few articles and Executive Reports. This relationship teaches me more about the newsletter and information business I’m in, , , valuable insights. Lesson learned – business relationships grow over time and add credibility to your business the more you do. 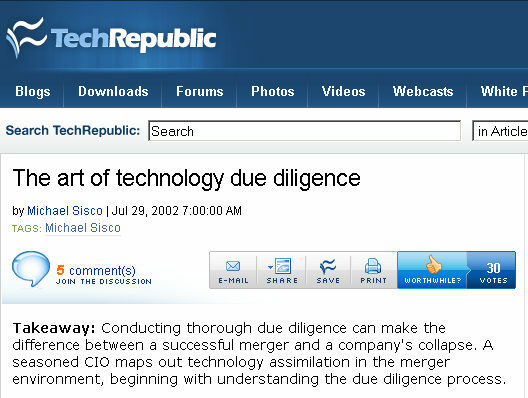 Tom Mochal and I meet one another in 2002 as we discover each other writing articles for TechRepublic. Turns out we lived just 20 miles apart in north Atlanta at the time. We start meeting quarterly with a few of my “inner circle” colleagues, my most trusted advisors, to discuss our businesses and to develop strategies for the future. 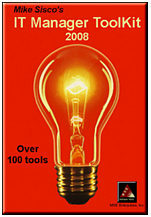 The October 2005 strategy meeting identified the possibility of us creating e-Learning modules for our audiences (project managers and IT managers). We developed a test for our January 2006 Kickoff Meeting and ran it by others including two of the principals of IT Business Edge and Dan Tankersley who had been part of my ideas from the very beginning. The concept looked like it would be a winner so the 20 Minute IT Manager was born. Three years later, we wrapped up the program after delivering 162 weekly sessions to subscribers in many parts of the world. 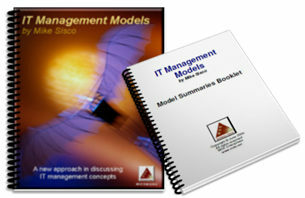 We now have a robust training library that provides anyone with an ability to develop their management skills. Lesson learned – it’s extremely important to bring in more brain power to discuss possibilities of your business. Projects seem to get bigger. We release the most comprehensive set of training and tools to support IT due diligence and assimilation work that’s based on the processes and tools I developed in participating in over 40 company acquisitions. 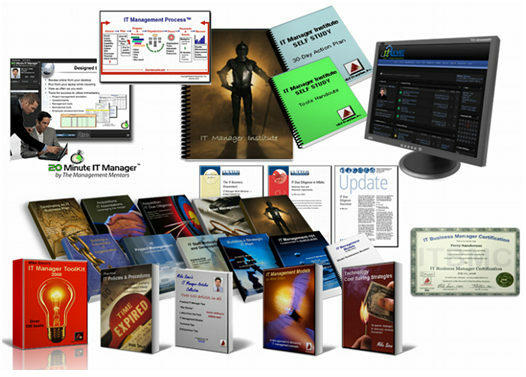 This product bundle had been a goal for several years because of the popularity of my book, Acquistion: IT Due Diligence (our best single book seller), but I couldn’t seem to get to it. Lesson learned – tools like Articulate (www.articulate.com) can help you bring your experiences to life without having to deliver them in the classroom. 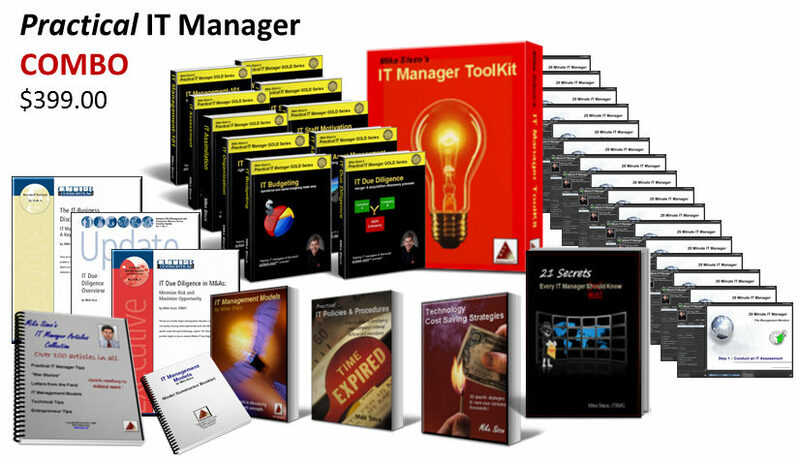 We enhanced the IT Manager ToolKit with 22 more tools, now 102 tools in all. The launch was very successful and made the product even more beneficial for our clients. Lesson learned – enhancing your product or services adds value for both your client and your company. 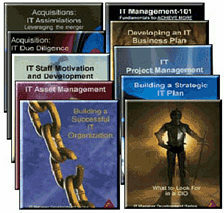 A 2-year effort is finally completed with the launch of the IT manager Institute Self Study. In the course of developing the self study, I completely overhauled the class with new content, better graphics, a new format and new slides. The IT Manager Institute is better than ever and we positioned MDE to be able to deliver the Institute program and ITBMC certification to any IT manager in the world. The launch was a huge success and I did it from our Camp Liberty on the Buffalo River. Another key step in my mission of “helping IT managers of the world achieve more success” is achieved. 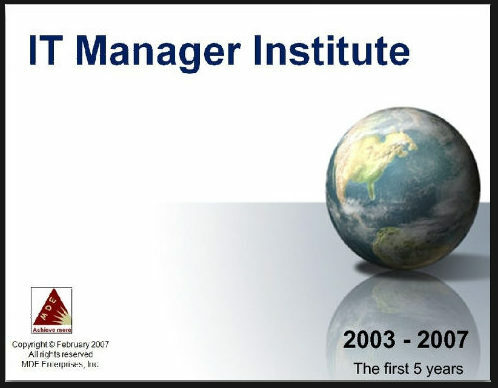 In just a year, the self study program has already allowed over 100 managers from around the world take advantage of the IT Manager Institute program who probably would not have been able to before. The self study is a significant part of our company’s long term strategy. Lesson learned – stay focused to your mission and learn alternative methods to reach your goals. A recent discovery that I’ve been avoiding for years is in incorporating a Blog in my overall strategy of providing IT manager tips and tools. Discovering the WordPress tools has been nothing short of phenomenal for me. The tools are simple, easy to use and gives me a super way to share information with my followers. I should have listened to the IT Business Edge guys when they recommended I start a Blog in 2006. Never too late to learn, I guess. Lesson learned – investigate things your inner circle suggest to you rather than discounting the idea as “not being a fit”. Today, we are a 10-year old company, , , a significant achievement in that there are thousands of IT managers around the world who use my practical IT management processes and tools. This feat probably amazes me more than anyone because I consider myself to be just a small town country boy at heart. Ten years sounds like a long time but I’ve had so much fun it doesn’t seem all that long ago when I decided to branch out on my own. When you love what you do, the hard work doesn’t really seem like work. I’ve learned a lot and have so much more to learn about running a business, and I’m glad we made the investment to make MDE Enterprise, Inc. a reality. We are optimistic about our future and believe we are better positioned than ever to achieve our mission of “helping IT managers of the world achieve more success”. New projects are underway and the future looks bright. I hope some part of what I’ve shared in growing my company will help you in your situation.